This amulet is for rich, luck and good business attraction. Thai people believe this Wealth Goat Rich Luck Good Business Charm Thai Amulet will make all your wishes for rich & luck come true. When you keep this Wealth Goat Rich Luck Good Business Charm Thai Amulet with you, other people will love you and be kind to you. Your business will easily success. Luck will be with you. Only success will come to you. You'll have more and more asset, wealthier and wealthier. Anything you hope for will be achieved much easier and more conveniently than before. 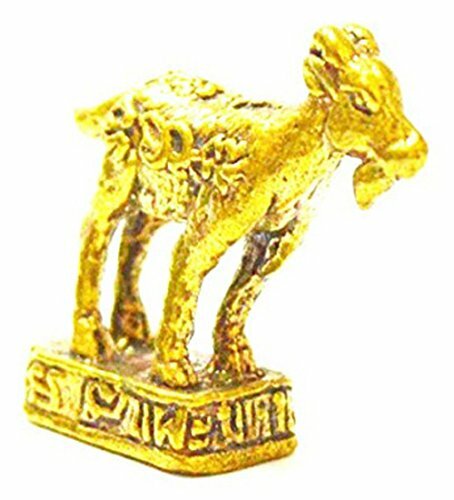 This Wealth Goat Rich Luck Good Business Charm Thai Amulet will ward off evil and bring you good luck. Aproximately: 1.0 CM Wide x 1.5 CM Height.